Cooking, Cronk, and Two Crazy Dogs: Leftover Christmas Ham? Make Ham and Potato Soup! Leftover Christmas Ham? 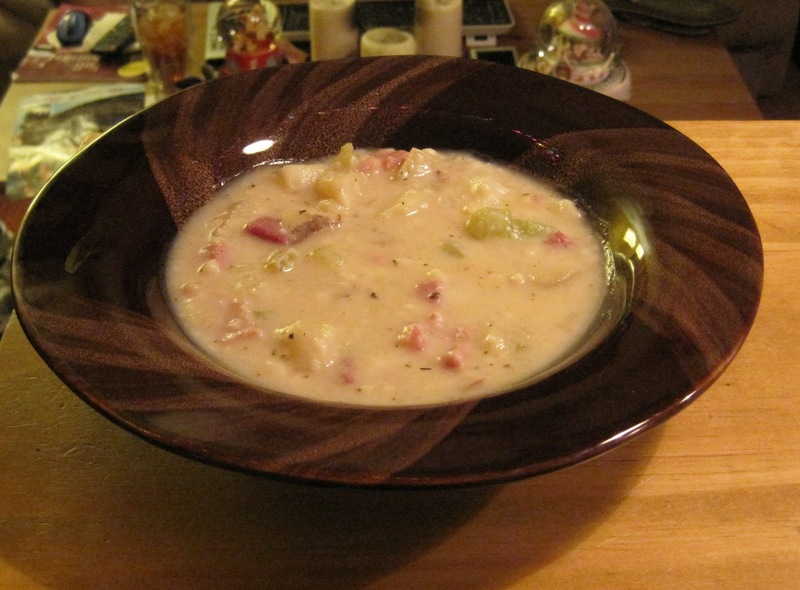 Make Ham and Potato Soup! I made a ham for Christmas and even after sending some home with my guests, still had a decent amount left. This was a quick and easy way to use it up. 1. Heat the olive oil in a dutch oven, or other large pot, over medium heat. Add the onion and celery and cook for 4-8 minutes until the onion is just starting to brown. 3. Melt the butter in a saucepan over medium heat. Whisk in the flour and cook for 1-2 minutes. 4. While flour and butter is cooking, microwave the milk on high power for 45 seconds. Whisk the heated milk and optional seasoning into the butter and flour mixture. Cook for 3-5 minutes, or until slightly thickened. Congratulations! You've just made a roux, a thickener for soups and stews.